The Dim Sum Diaries | Tate Dining Room & Bar | "One cannot think well, love well, sleep well, if one has not dined well." After hearing mixed reviews about Tate Dining Room & Bar, I had to check it out for myself, firstly to see if the food exceeded the rather low expectations, and secondly, more importantly, to see if I was still hungry after nine courses, as many who had gone before me were. The setting is gorgeous, elegant and girlie, designed by Candace Campos, the same amazing designer behind MANA! and Heirloom Eatery. 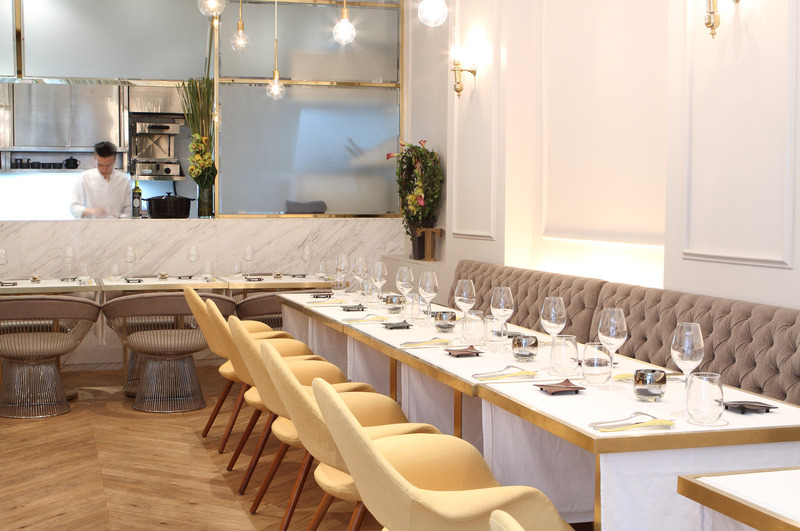 A lot of white and cream shades with good use of lighting make the space, which seats only around 26 diners, appear much larger than it is. Set menus come in two forms: a six-course sensualist set (priced at $680) or a nine-course gastronomy set (for a whopping $980). It is clear to see just how much thought has gone behind each and every dish, as chef Vicky Lau (formerly of Cépage), creates her ‘edible stories’, each entitled with a lovely name. 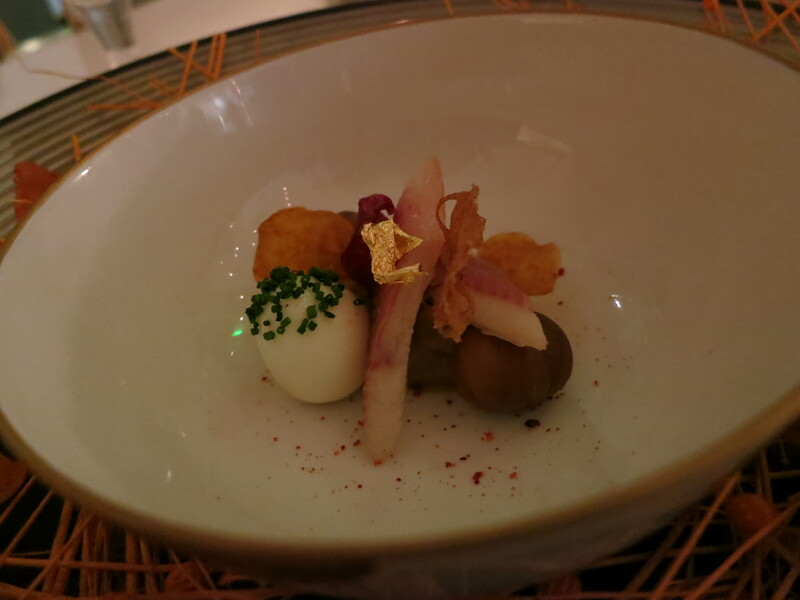 Our nine-course menu began with a ‘Potato Ice Cream’. This interesting contrast between the crispy hot potato croquette and smooth cold potato ice cream, broken up by a line of peanut sand, was apparently inspired by what Chef Vicky pictures when thinking of the beach on a hot summer’s day. 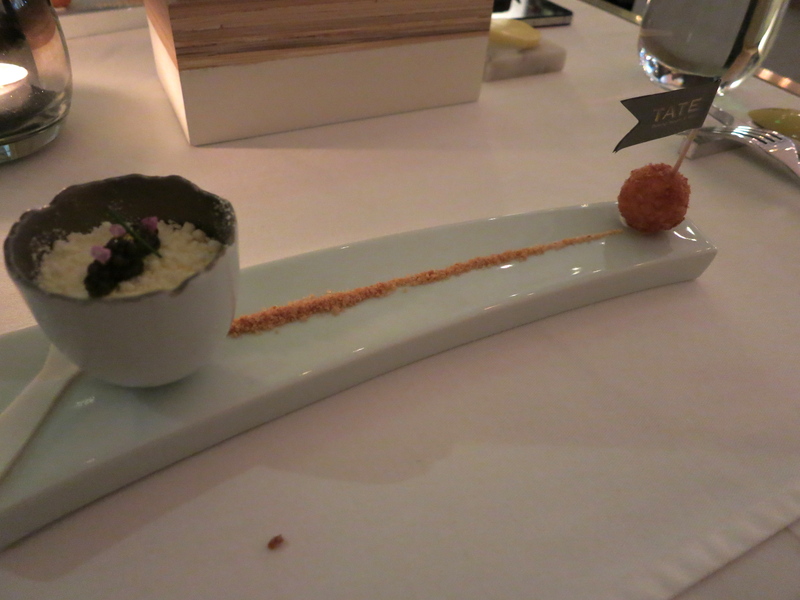 I loved the croquette and the peanut sand but couldn’t quite work out my feelings towards the ice cream. The smoked salmon and caviar were welcome additions, although perhaps the flavours were a little too strong for the mild potato purée. The ‘Autumn Delight’ that followed was lovely; consisting of chestnut purée, whole chestnuts, smoked eel, a quail’s egg and vegetable crisps, it was a combination of flavours and textures that I would never think to put together, yet somehow they worked to create a wonderfully comforting and definitely autumnal dish. The ‘Foie Gras Terrine’ was one of the star dishes of the night; buttery smooth cubes of foie gras were paired with grapes, candied walnuts, crumbs of Sauternes jelly and goma sesame sauce, served alongside a perfect brioche. 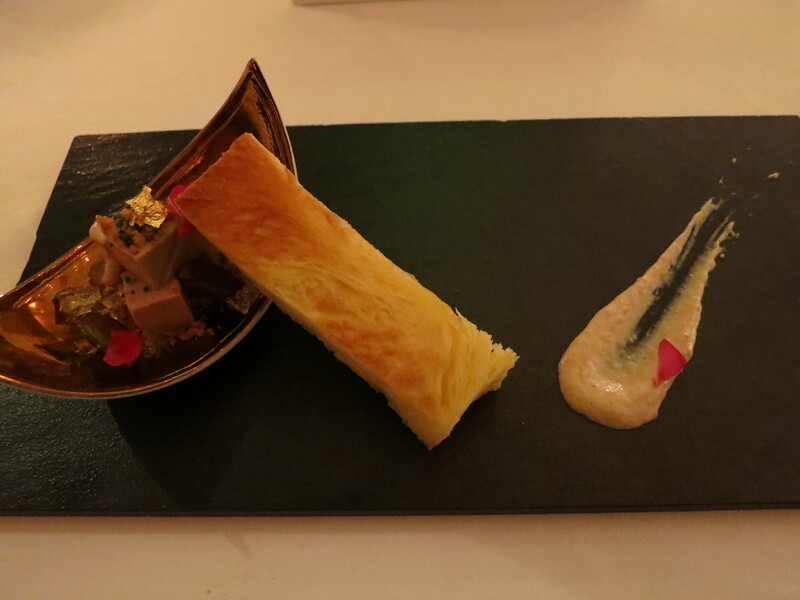 I was in foie gras heaven and definitely took advantage of the fact that I was dining with a non goose liver lover. Unfortunately the dish that followed, ‘Forest Essence’, was nowhere near as good. 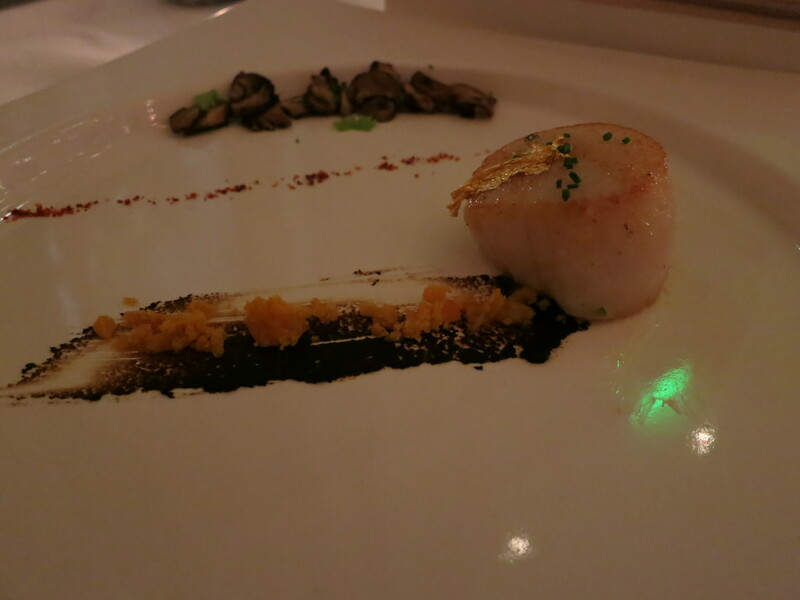 The single scallop was overcooked and rubbery, the mushrooms were dry and tasteless and the black garlic paste was smeared so thinly on the plate that it needn’t have bothered being there at all. Possibly the most exciting thing about this dish was the line of crushed chilli. A ‘Tomato Consumme’ (was the misspelling intentional?) came beautifully presented in an adorable little teacup. 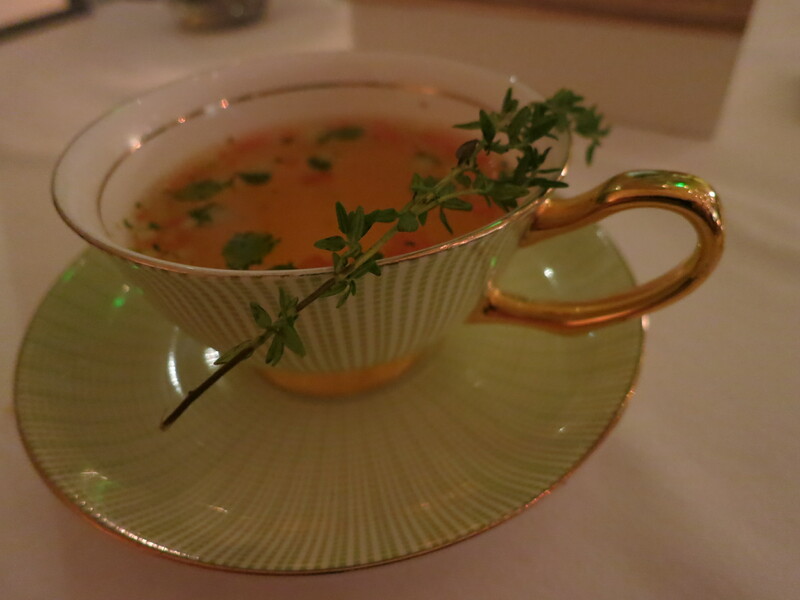 Although the actual soup looked rather boring, I liked the delicate flavours and found it lovely and comforting, with the basil oil and sprig of thyme serving to add a hint of summer. 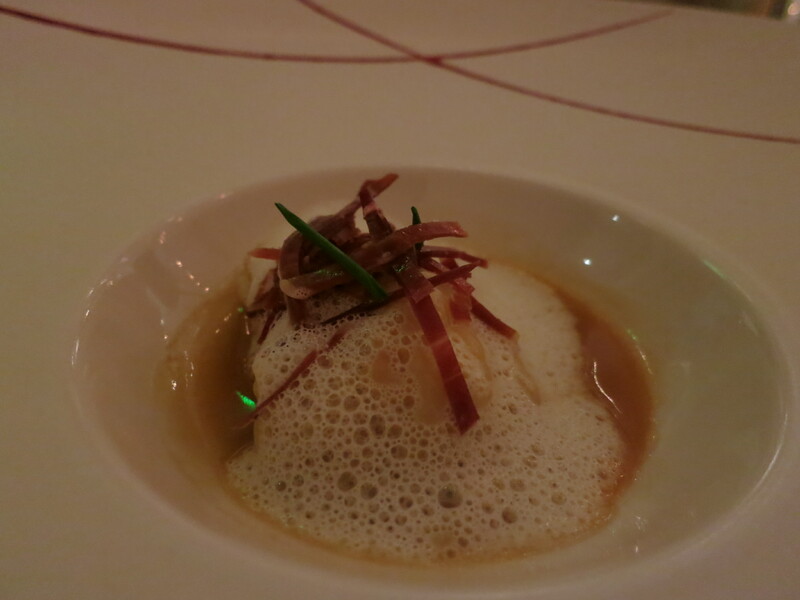 The cleverly named ‘Hamgoustine’ consisted of ham and – you guessed it – langoustine ravioli, served in a ham broth, topped with parmesan foam and strips of Serrano ham. The ravioli were cooked to perfection, and I loved the contrast of the two distinct fillings, however my only complaint is that the broth was a little too salty. 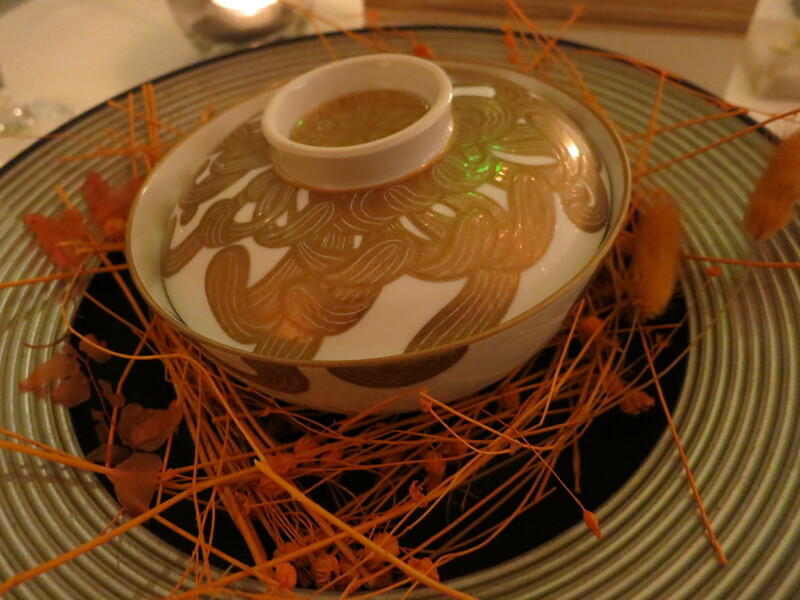 The absolute star of the night was the ‘A4 – Kagoshima Beef Rib’. 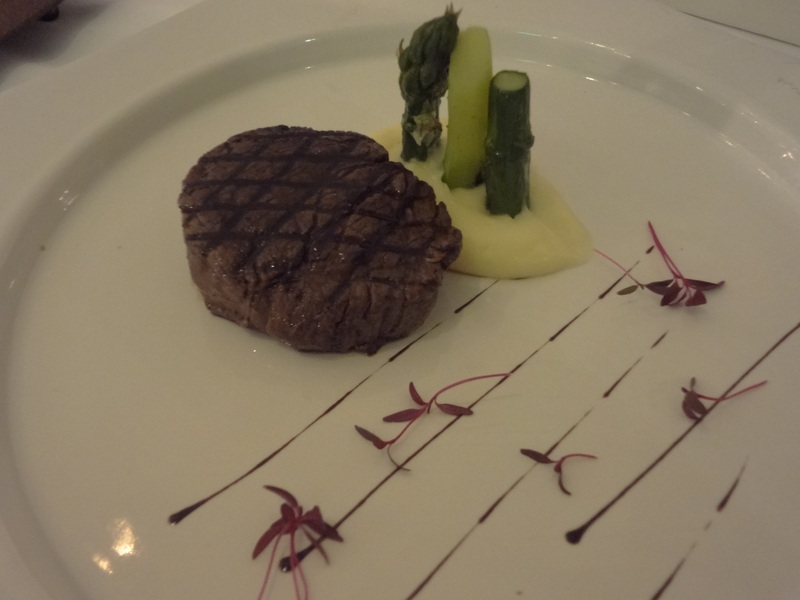 The medium-rare meat was melt-in-the-mouth tender and beautifully flavoured, paired with a miso potato purée and crunchy grilled asparagus: utterly faultless. 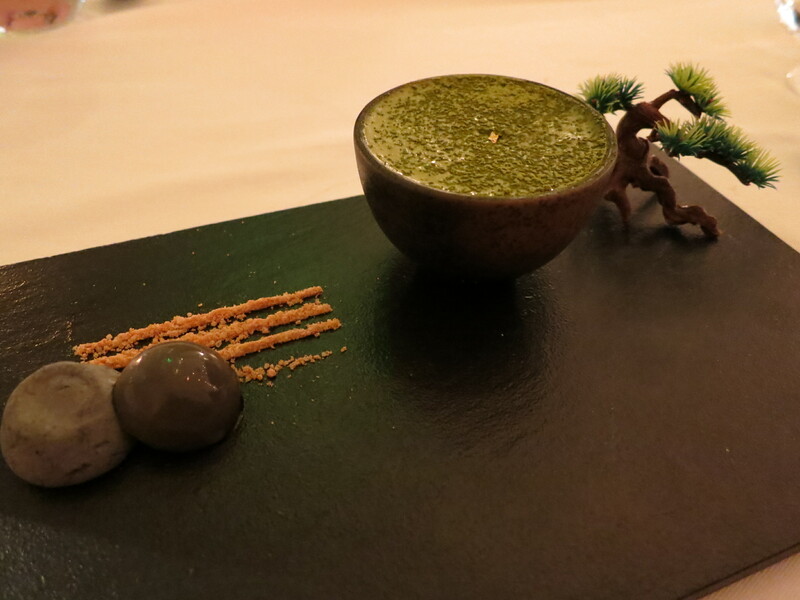 A pretty ‘Zen Garden’ appeared next, but unfortunately it wasn’t exactly our idea of bliss; as much as I like green tea as a drink, I’m never a fan of green tea desserts, so the matcha green tea mousse just didn’t work for me. Served on top of white chocolate mousse and alongside sesame panna cotta and peanut sand, the whole thing was just unbearably sweet for my taste. 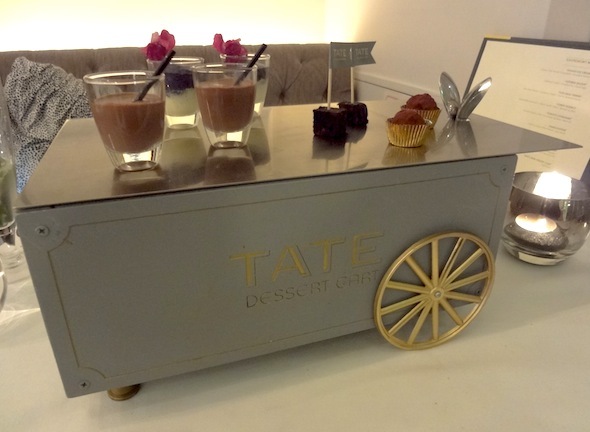 ‘Tate’s Mini Dessert Cart’, however, made up for it in both appearance and taste. It was a chocoholic’s dream, offering mini chocolate mousse, a rich chocolate drink, dark chocolate brownie and last but by no means least, a chocolate hazelnut truffle. 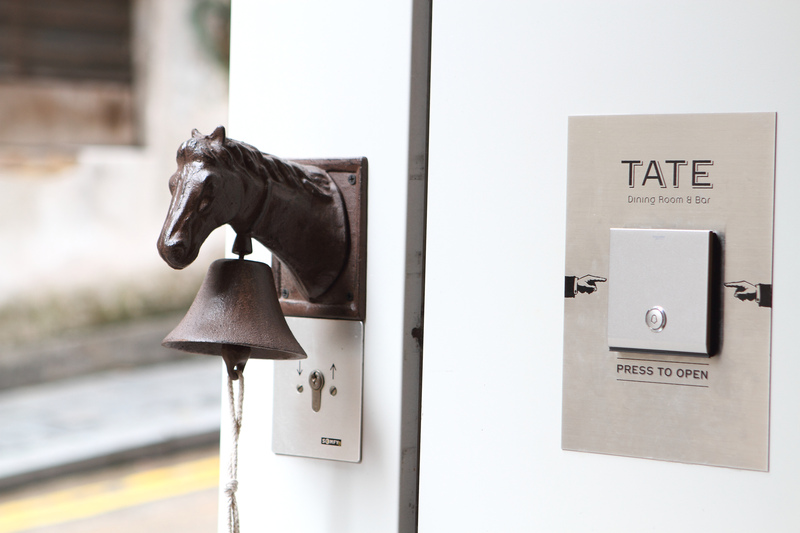 The staff at Tate are very welcoming and knowledgeable about each dish. Service is swift, but not to the point of feeling rushed. With Chef Vicky’s creativity and passion it has the right tools to be something really special, but there are still a number of issues that need resolving first. Now to answer the question you’ve all been waiting for: Was I hungry after my nine-course meal? No, but neither was I bursting at the seams, and I’m not sure I agree with paying $980 and to not feel like I’m going to pop. The pictures look great, and the presentation very well done indeed – love that dessert cart Definitely makes me want to try it for myself.